It's where the thrill comes from, right? When you know that people may still die, when the detective is fighting against time, when it's so difficult to make out of the evidences they get, when the culprit perfectly performs his ritual every. single. time. I'd say that Marsons can throw in any crime out there and make it completely riveting - she showed this in Lost Girls. This is Marsons' style - she puts you inside the mind of the culprit. It's one of the things I LOVE about her novels. You get to know their reasons - where they're coming, why they're doing what they're doing. The POV here kept me intrigued. It kept me wondering - his full story, why he keeps on talking to his 'mommy', the hatred he carries. Do you remember Tracy Frost? Your friendly (not!) journalist who never fails to annoy Kim. I like how Frost's character was further established here. Yes, we get to know Frost more. And yes, there's development. And yes, I'm also excited to read more of Frost in the next books. Frost's role in Play Dead made things even exciting to read. She has POVs in the novel!! I like reading more about Kim. I like getting to know Kim. It makes me want to hug her and tell her that don't be afraid, everything's going to be fine. It's a shame that Kim isn't open for relationships. She doesn't tie herself close to people (although she unconsciously tie herself to the dead and eagerly strive for their justice) but it's shown well why though and I understand Kim. I LOVE how Marsons connected two cases that are seemingly unrelated - the main case opened for Kim and the other is something she ended up obsessing (okay, maybe that's going overboard) about (because of Tracy!!). Anyway, I like looking at cold cases. I kind of like the challenge that lies there. And oh the twist that comes with this!! Marsons has caught me off guard again! Again. I don't know. I like it but it's not a big deal for me. It's not so much romance-y, swoon-y kind of thing but Dr. Daniel Bate could possibly be swoon worthy if you ask me. ANYWAY, I'm still #TeamMatt if you're asking (lol). 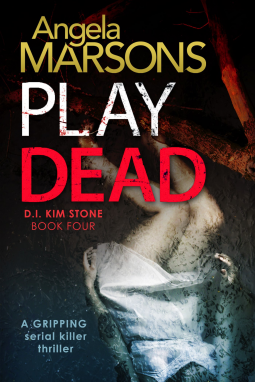 OVERALL, Play Dead is a thrilling crime fiction that kept me at the edge of my seat, kept me intrigued, and kept me excited to know what happens next. It even caught me off guard. Marsons never disappoints. Play Dead and the entire D.I. Kim Stone series is a highly recommended mystery-thriller read for those who enjoy crime fiction with detectives and police procedure. How do you feel about crime fictions taking on two cases? Have you read crime fictions that involve the POV of the murderer? How do you feel about them? Do you think spoil things for you?